Are you loosing money and don’t even know it? Are you using a service to process your orders which allows you to customize the order page with your own logo or website images to make it look more like your website? Well the good thing is, your ahead of the game and realize you need to utilize a service that processes payments for you on their secure (SSL Certified) servers. And you also realize that you need to build brand recognition on the order page so that your customer realizes it is you they are buying the product from. But did you realize that unless your image is hosted on a secure (SSL) server, your customers will receive an annoying (and confusing) warning message like this? In most cases they don’t know what to click and leave your order page with out buying because they don’t know what is secure and nonsecure and will not want to enter their credit card information without knowing for sure that their credit card information will be safe. 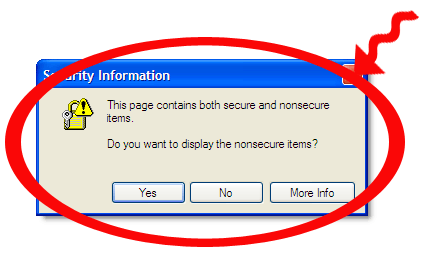 This message WILL be displayed each and every time someone visits your order page if you do not have secure web images. SecureWebImages.com provides secure storage space for logos, web images, and any other type of web graphic you or your company need SSL image hosting for. Our service is simple, affordable and will put an end to these order stealing warning messages, and give your customers the confidence of totally secure payment processing. Get Your Secure Hosted Images Right Now! Our secure image hosting prices are set for any budget and scaled to meet your needs. You’re not locked in to a long term agreement you only pay on a month to month basis as needed. Being an online business owner you understand the importance of building a trusting relationship with your customers and we look forward to that same some relationship with you. SecureWebImages.com makes so easy for you to utilize our service just follow these 3 easy steps after you become a member. Step 1: Login in to our secure member’s area with member name and password provided. Step 2: Click the “Add and Image” button and choose your file from your computer. Step 3: Upload your image and get your secure image URL that you can copy and paste anywhere you like. It really is that easy and you can start uploading your images right now. Start off with our intro level of 100Mb a month for only $4.95.